This paper explores the potential challenges that could have contributed to the difficulty of achieving ‘Zero tolerance’ to FGM/C. In an attempt to answer the question the research looked at the language and representation of the initial campaigning, production of FGM/C and the reactions to the issue at a global level. Debates about the medicalization and criminalization of FGM/C are discussed in order to show the underlying contradictions and complexities of dealing with FGM/C. It also looked at the role and position of Anti-FGM/C NGO’s and their challenges regarding the practice. Information from a semi-structured interview with key informants working on anti-FGM/C organization is used to complement, the analysis of selected secondary data. 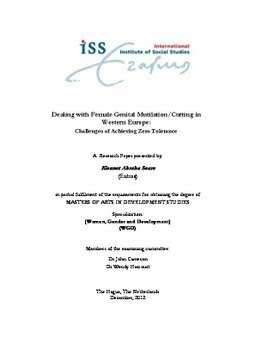 The research argues that the issue of FGM/C is caught in debates of polarized positions loaded with abstract meanings and has moved its focus from the ‘woman’ or the ‘girl’ in the practicing communities. It shows the tendency of the issue to be driven by the international community and hence its limitation in reaching the very communities it intends to change. It also highlights the lack of accuracy in basic the knowledge about prevalence of FGM/C.